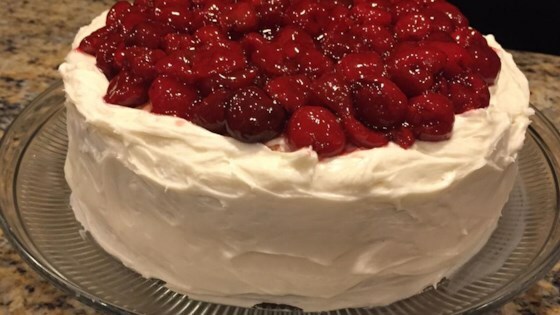 "A double-layer cake made with cherry pie filling, topped with cream cheese frosting and cherry pie filling. Very moist and dense and cherry-licious. You can also put it in a 9 x 13 inch pan if you don't want to store the two layer cake"
Ignore instructions on cake box. In a large bowl, beat eggs, add 1 can pie filling and combine. Add cake mix and beat until well mixed. The batter will be stiff. Pour half of the batter into each pan and spread evenly. Bake at 350 degrees F (175 degrees C) for about 25 minutes, or until a toothpick inserted into the center of cake comes out clean. Cool a couple of minutes, then turn layers out onto cooling rack. Cool completely before icing. For the icing: Beat butter, cream cheese, and vanilla until smooth. Add confectioners sugar and continue beating until smooth. Ice a layer, add the second layer, and finish icing the cake. Refrigerate until time to serve. Just before serving, pour the cherry pie filling on top and spread it gently to the edges. A few of the cherries will roll down the sides. That's what you want. This cake tasted quite artificial and very sweet. I probably won't make it again. This is a great recipe. I omitted the cherries on top, and I also added 1/3 c of butter to the batter. I baked in a 9x13" pan. I will be making this again and again. Thanks for sharing. I made this as a 2 layer cake- couldn't figure out exactly how to do it in a 9x13. Interesting cake, almost a cheesecake flavor. The men really loved it. I liked it but it wouldn't be favorite. I made this cake for Thanksgiving. I got more raves than I knew what to do with. It is a very attractive cake-a pretty pink in the middle. It is undoubtedly the best cake I've ever eaten.